Yuma Arizona is located in the southwest corner of Arizona near the Arizona-California border. Yuma was important to the development of the southwest because it was at the safest spot to cross the Colorado River. Essentially, all roads led to Yuma Arizona from the times of the early Spanish explorers to the 1,000 of people leaving the Dust Bowl area of the late 1930’s. A Marine Corp Air Station is located a few miles to the south of Yuma Arizona and uses the Yuma International Airport for its operations. The facility began as a WWII pilot training base and over time was transferred to the Navy and became a Marine Air Station. Yuma Arizona is noted for its weather. Of all the places in the continental United States, Yuma Arizona is the least humid, driest, lowest precipitation and highest number of days with a high temperature of 90 degrees – 175 days a year! 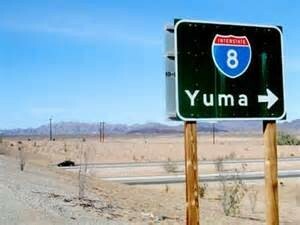 The population of Yuma Arizona in 2013 is estimated at about 100,000. The Yuma Arizona MSA population is estimated at over 200,000 with some 85,000 retires making it their winter residence. The median home value in Yuma Arizona at the end of 2014 was just over $129,000. The median list price of a Yuma Arizona homes is $174,000 or about $113/sq ft. While the median selling price of homes sold is just over $157,000. A December 2014 publication by the National Association of Realtors on best places to live for baby boomers in the United States has Arizona with 2 spots. Tucson and Phoenix. To almost no ones surprise, two key factors in selecting the best places to live where a lower cost of living and sunnier weather. For those considering Yuma Arizona for a future place to retire, you may also want to put Tucson AZ and the Northwest Tucson communities on your list of places to explore. The City of Tucson is home for the University of Arizona. Go Wildcats!! That means there is an endless list of things to do and activities available. The Tucson area has rich cultural heritage and an abundance of Tucson attractions. Museums, galleries, shops, and live performances are available the year around. To give you a flavor of the many things Tucson AZ has to offer, here is our top 10 list. To the north of Tucson is the Town Oro Valley AZ. Just north of Oro Valley, near the intersection of Hwy 79 and Oracle Road, are two Robson Resort Communities. SaddleBrooke to the south and SaddleBrooke Ranch. These are two very popular active adult communities just north of Tucson AZ. There are other adult communities in Oro Valley AZ that provide the opportunity to meet new friends and pursue personal interests in an active retirement. If you are considering a winter retreat or future place to retire in Yuma Arizona, then also take a look at homes Northwest of Tucson AZ or Green Valley to the south. Oro Valley, Dove Mountain and Marana all have active adult communities and lot of things to do. Give us a call, we can help you find that perfect place in the Northwest Tucson area.